a build-your-own sandwich and salad bar in the heart of downtown Ottawa, I felt almost like I was walking onto a beach boardwalk in Miami. The palette is pure citrus, and the high ceilings and bright lights give the impression of a clear, sunny sky. My lunch was prepared by owner Marc, whose previous gig at a coffee shop had him weighing in at 240 pounds, but whose year and a half at Vitae-Mine have whittled him into a svelte stunner whose teeth are apparently polished daily by angels. I had a spinach salad with miso ginger dressing and marinated tofu, as well as a “booty shaker” smoothie. 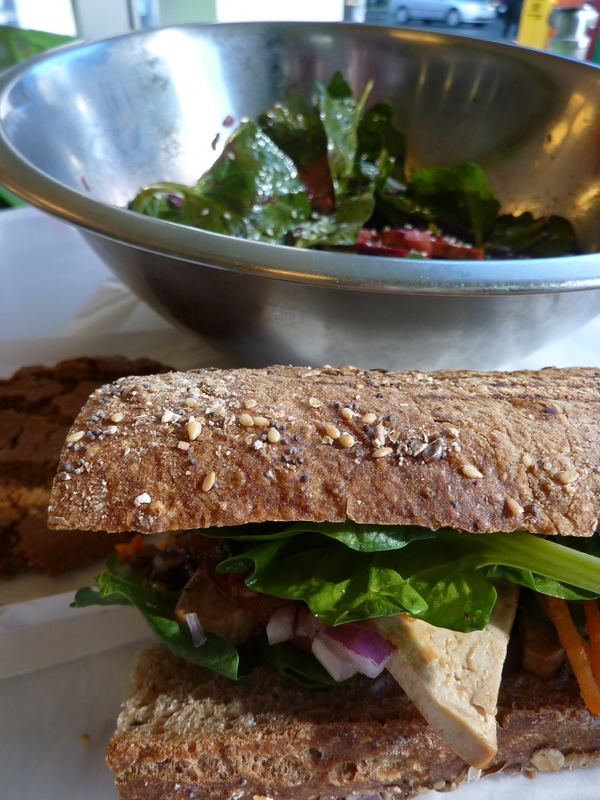 Neil had a veganized sumo tofu sandwich, a “bossa nova” smoothie and a B-goods cookie. Now, you know how I feel about salads that are not wrapped in rice paper or bread or pizza, but I thought that I really should try the salad since it was sort of Vitae-mine “in the raw.” If the dressing was bland, if the greens were limp, if the tofu was mushy, there’d be no hiding it. I’m pleased to report that none of these deficiencies were evident. The dressing was interesting – spicy, which was unusual and neat. The tofu was tasty and had that neither too-soft-nor-too-leathery texture that is surprisingly hard to achieve. The spinach was also unusually good – noticeably less bitter then most of the stuff I’ve bought of late. Neil’s meal was even better – it was basically the same thing I had, only piled upon a crusty (in the good way) and seedy (also in the good way) roll. My smoothie beat out Neil’s, though. The booty shaker was far more flavourful than the bossa nova, and earned Marc a lecture by me on the merits of stevia extract. On the whole then, Vitae-Mine is a great place for the sort of veg*n lunch which is hearty enough to be satisfying, while healthy enough to entitle you to something smothered in Daiya for dinner. I should note that Vitae-Mine’s menu is a bit deceiving, actually containing no vegan options. I can state with certainty, however, that the staff are well-aware of what “vegan” means, and that they’ll happily accommodate us by swapping in tofu and nuts for meat and cheese. Also, all of their salad dressings are vegan! 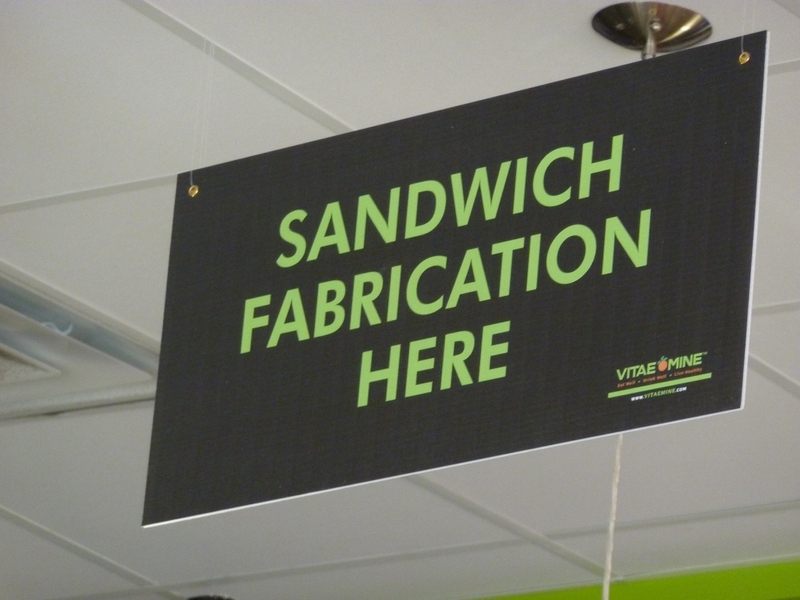 What’s more, owner Marc is keen to respond to the needs of his customers. 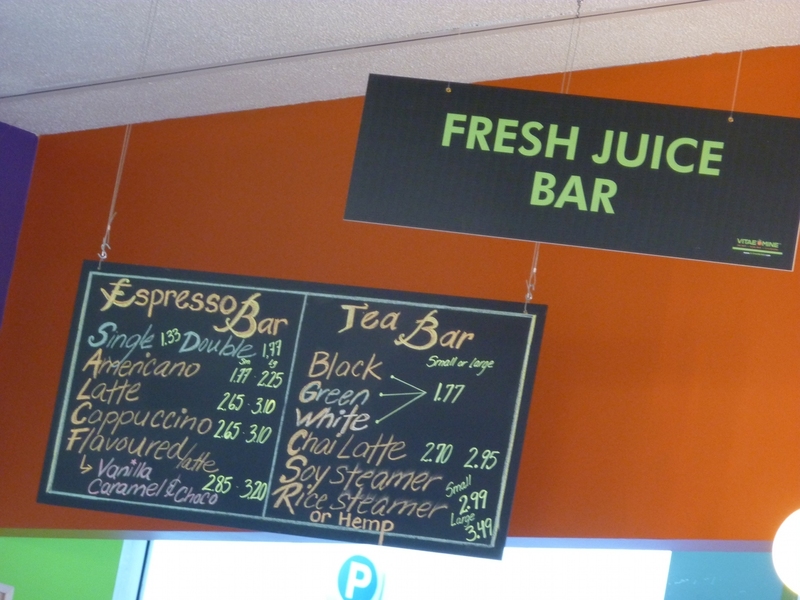 He’s expanded the restaurant to include both a smoothie and a coffee bar, as well as a number of gluten-free options. He’s eager to understand us veggies better and is slated for a consultation with our restaurant outreach program. 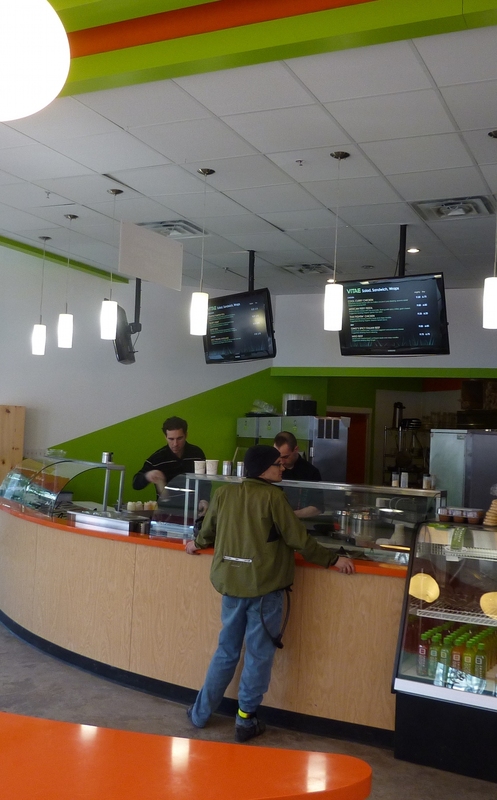 So if you work downtown, take advantage of your NCVA member discount and head to Vitae-Mine for a sammich and a smoothie; and maybe take a second to tell the staff how they might attract more vegan customers. In fact, tell Marc himself, if only for a glimpse of those pearly whites :). I’m glad to hear that the sauces have been confirmed as vegan. I really hate going into places and having to ask a zillion questions. Thanks for doing the research for us, Erin!